The Shohei Ohtani frenzy has at least somewhat died down. This will by no means be a permanent thing, but, to a certain extent this is always inevitable, whenever something new isn’t so new anymore. We’ve seen Ohtani now. We’ve celebrated him. We’ve celebrated the pitching, and we’ve celebrated the hitting. On top of that, Ohtani hasn’t played very much lately. There’s been a blister thing, and now there’s an ankle thing, and while these things aren’t particularly serious, Ohtani has batted just twice over the past week, and he’s started one game on the mound. Neither of his last two pitching starts has been great. The internet, you might say, is waiting for Shohei Ohtani to have another moment. After all, we all just want to be impressed. But in reality, Ohtani just had another moment. On Friday night, Ohtani hit a home run. And not a regular, run-of-the-mill home run. This requires a little bit of background, but that home run was really amazing. Ohtani is developing before our very eyes. I wrote about this three weeks ago. There’s a book on Shohei Ohtani, and it’s a book that’s existed in the same form since before he played his first game of the spring. I wouldn’t say it’s very original, but, according to many observers, the way to beat Ohtani — the hitter — is to pound him inside with fastballs. Those fastballs, in turn, can set up softer stuff away, but it’s all about the heat. Ohtani was perceived to have a vulnerability, maybe because his swing would get too long. When Ohtani gets his arms out, he can hit the crap out of the ball. Pitchers would make him prove he could keep his hands in. 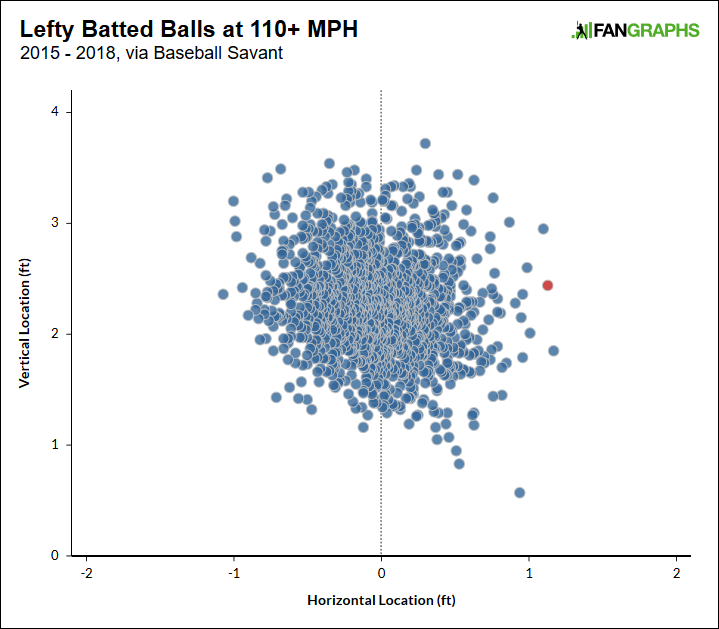 According to the data at Baseball Savant, no one has been pitched more inside, on average, than Ohtani. 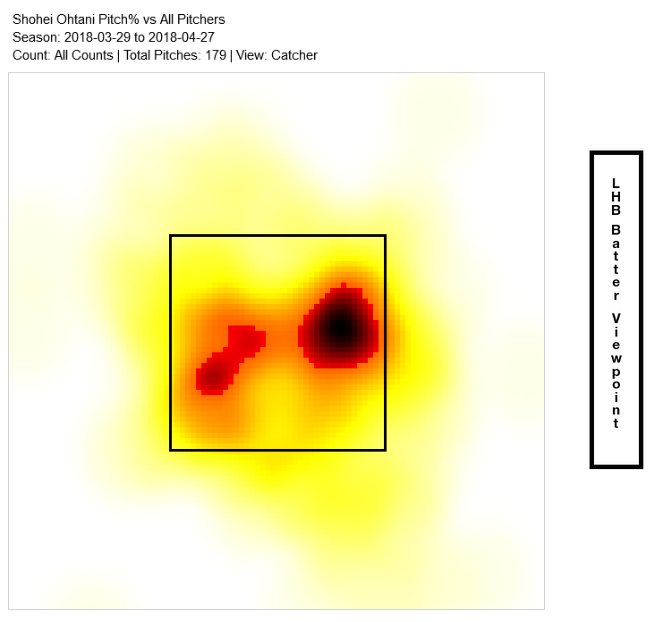 By average horizontal pitch location, Ohtani is tied with Eric Hosmer. There was the theoretical scouting report, and we’ve seen it be put into practice. Pitchers have tried to get under Ohtani’s hands. They’ve tried to bust him up, in an effort to force weak contact. Friday night, Ohtani found himself in the lineup, scheduled to face Luis Severino. Few starters throw harder than Severino does. Ohtani came up to bat in the bottom of the second, and the first pitch was a fastball away. 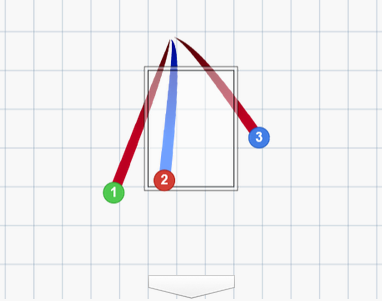 The next pitch was a changeup over the outer half. With the count even at 1-and-1, Severino went to the inside fastball. The fastball clocked in at 97 miles per hour, and it was inside off the plate. Technically, if you want to be needlessly critical about it, you could say Ohtani shouldn’t have swung at a ball. Odds are, Ohtani would’ve been ahead in the count 2-and-1. But, this is a bad take, because the idea is to swing at pitches in hittable areas. For Shohei Ohtani, this must be a hittable area, because the ball left his bat at 112 miles per hour. Severino threw a ball in at 97, and the ball went away flying even faster. Ohtani hit exactly the pitch all the reports said he couldn’t get to. You can observe the swing mechanics for yourself. The slow-motion video makes it easy. It’s not like there’s anything ground-breaking in here — Ohtani kept his hands in like some kind of left-handed prime Miguel Cabrera. 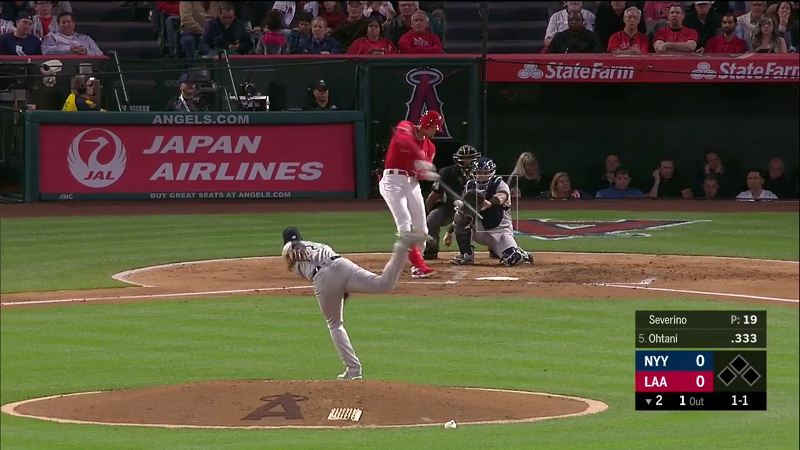 Ohtani’s mechanics look exactly like how you’re supposed to hit that pitch, but the point is that he wasn’t supposed to hit that pitch. He wasn’t supposed to have those mechanics. I’m sure Severino was surprised. He hadn’t even yet set Ohtani up. Ohtani hadn’t seen an inside Luis Severino fastball. When one was thrown his direction, it’s like he was waiting for it. Same principles apply. Good luck getting your bat around on something so inside. Ohtani pulled it off. He didn’t just succeed in keeping his hands in, shortening up his swing — that very shorter swing resulted in a line-drive dinger. Rhys Hoskins has yet to hit a major-league batted ball as hard as Ohtani’s home run against Severino. It demonstrates what you might call “easy power.” Ohtani’s swing doesn’t need to be long in order to be powerful. That’s quality contact on a pitch on the edge, and if the timing were ever so slightly different, we could be looking at a double or a homer. 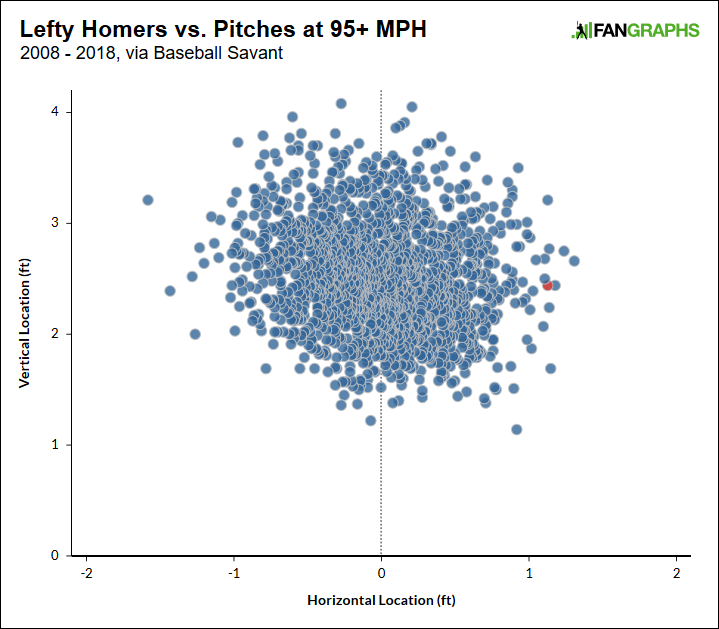 Every hitter has trouble spots somewhere, and Shohei Ohtani is obviously not fully understood, but we’ve now seen him destroy an inside fastball off the plate. He’s also taken good recent swings against pitches away. There has to be a weak spot, but I don’t know where it is. Ohtani arrived in the States as a much-celebrated talent. He also arrived as a hitter in need of adjustments. Already, he’s adjusted his own timing mechanism, dropping the big leg kick. And already, he’s adjusted his own approach to inside pitches. According to the scouting reports, you could beat Ohtani by brushing him back with inside heat. Ohtani just turned on one of the better fastballs in either league. As far as Ohtani’s ability is concerned, I used to think it was a problem of imagination. I don’t think that anymore, because no one has to imagine how good Ohtani already was as a two-way player in 2016. It’s not really up to Shohei Ohtani to prove this experiment can work. It’s up to the rest of the major-league players to stop him. We hoped you liked reading Shohei Ohtani Had Another Moment by Jeff Sullivan! In the last GIF he is starting the hips very early and still has the length to cover the outside half. It’s like Ohtani is 1.5 Ichiros. That HR did remind me of Ichiro. I’m glad I’m not the only one thinking that about his swing. Imagine Ichiro with loft and power… and allowed to be a starter every seven days. It’s such a weird swing! That does not look like the swing mechanics of a hitter who’s going to make enough contact at the MLB level. The Ichiro comp is a good one mostly because it must take absolutely supernatural hands to do it — the superpower is the hand-eye coordination that allows him to make contact while the rest of his body is committed so early.